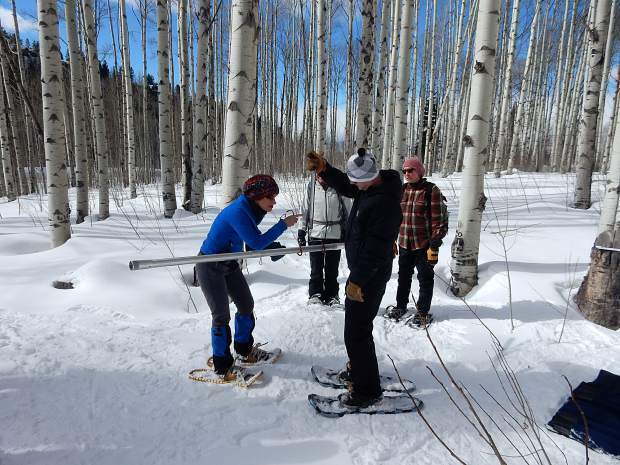 John Rutland (right), a Marble resident participating in a snow survey course, jams a special, hollow metal tube into the snowpack to take a core sample. Derrick Wyle of the U.S. Natural Resources Conservation Service supervises. Liza Mitchell of the Roaring Fork Conservancy digs a snow pit at the summit of McClure Pass on Sunday to help students in a workshop look for clues on the snowpack composition. Liza Mitchell reaches down more than three feet below the snow surface to collect a sample of snow near the ground. Derrick Wyle of the U.S. Natural Resources Conservaton Survey shows a class an automated Snow Telemetry station near the summit of McClure Pass. The site transmit data about the snowpack every hour. Derrick Wyle (right) measures instruments to gauge the snow water equivalent in the snowpack atop McClure Pass on Sunday. He is assisted by Frances Bogle of Marble. Liza Mitchell of the Roaring Fork Conservancy boils snow samples taken from different depths in the pit to demonstrate how the water density varies. All the automated Snow Telemetry sites in the Roaring Fork Watershed are measure well above the median. Here are the measures as of 3:30 p.m. Sunday. The first number is the snow water equivalent in the snowpack, the second is the percentage of median. 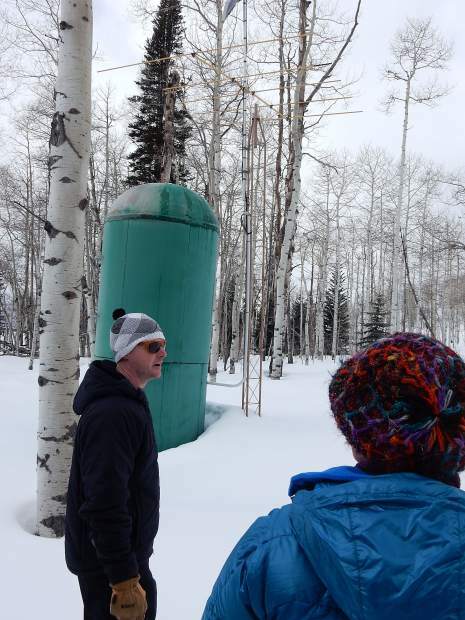 A dozen Roaring Fork Valley residents got an up-close look Sunday at how the weird weather has affected the snowpack this winter. 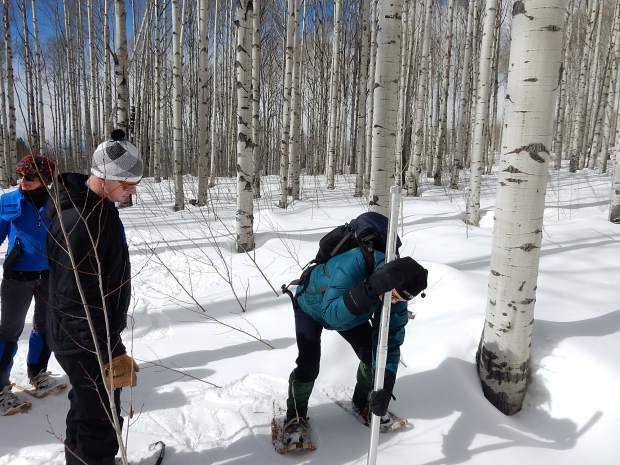 The group trudged into the aspen woods at the summit of McClure Pass during the cold morning to conduct an old-fashioned snow survey — ramming a hollow metal pole into the ground by hand power to take a core sample. Derrick Wyle, a soil conservationist with the U.S. Natural Resources Conservation Service, then walked the citizen scientists through calculations using markings on the pole and by weighing it to determine the snowpack density. The exercise confirmed that Colorado’s typical Champagne powder has been closer to Sierra Cement this winter. Warm temperatures have often produced a rain-snow mix this winter as well as a series of 50-degree days in February. The average of the nine samples indicated a snow depth of 38 inches and a snow-water equivalent — the amount of water contained within the snowpack — of 14 inches. 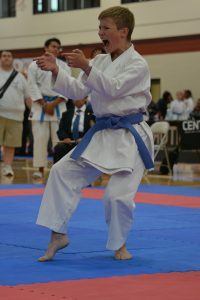 That produced an average water density of 37 percent. 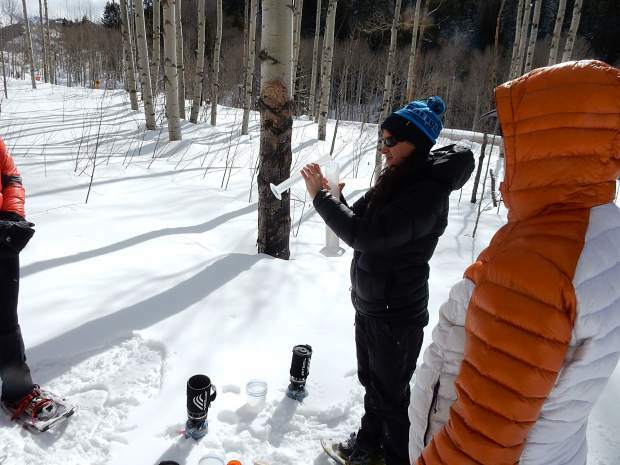 “This is really the meat of snow science,” said Liza Mitchell, education and outreach director for the Basalt-based Roaring Fork Conservancy. She co-directed the workshop. “Why do we care [about snowfall] beyond a powder day?” Mitchell asked. She answered the question herself by noting that most of Colorado’s precipitation falls as snow. The snowpack is used well into summer for irrigation and recreation. 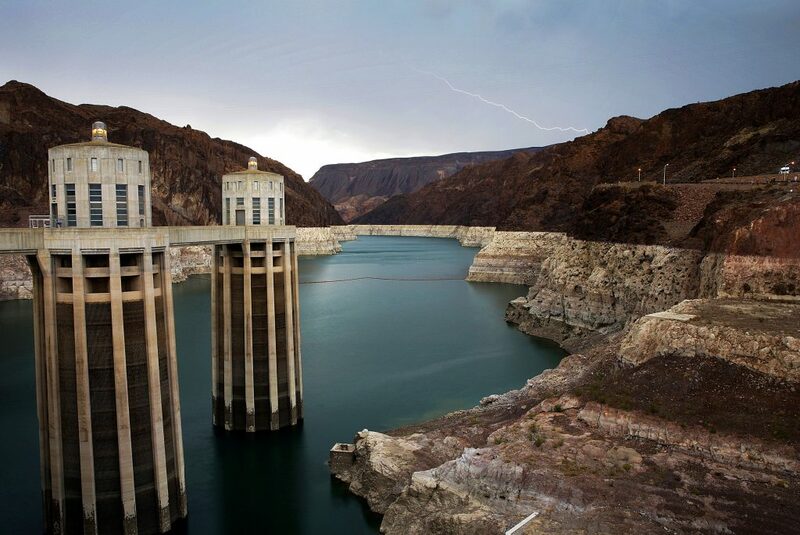 “It’s a natural storage system for water,” she said. After the students took their readings, Wyle disclosed that a nearby automated Snow Telemetry site was indicating the snow depth was 44 inches and the snow-water equivalent was 16.9 inches for a density of 38.4 percent. The field measurements were pretty accurate for a bunch of novices, he said. Wyle said the snowpack is denser than he would typically expect in the Colorado mountains in late February. Even with warm weather, it is a beefy snowpack. 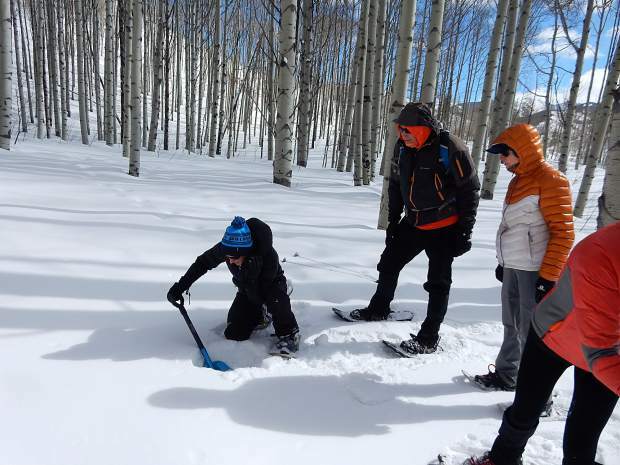 While Wyle took the students through a mock snow course survey, Mitchell worked with the group to dig a snow pit and analyze it for clues to the snowpack composition. The digging initially was easy with 3 inches of light powder covering the surface. That was the snow that fell in recent days. 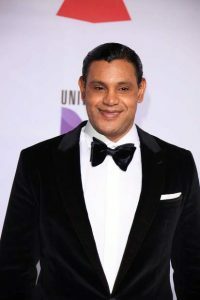 The fluff soon gave way to a thick, crusty layer that Mitchell said was baked and solidified during the long dry, warm spell in late January and February. Closer to the ground, more than 3 feet below the snow surface, the consistency was looser again. Mitchell planted thermometers at different layers of the snowpack and took equal-sized samples from the top and lower down in the dense layer. She mixed the snow samples with equal amounts of water and boiled them over Jet Boil burners she brought into the field. Once the snow was melted, it showed that the higher density layer, indeed, produced more water. Mitchell said getting people into the field is essential to Roaring Fork Conservancy’s mission to inspire people to explore, value and protect the Roaring Fork Watershed — an area that stretches from Independence Pass to Glenwood Springs and includes the Crystal and Fryingpan rivers and all their drainages. The watershed is about 1,400 square miles. “It’s about the size of Rhode Island,” Mitchell said. 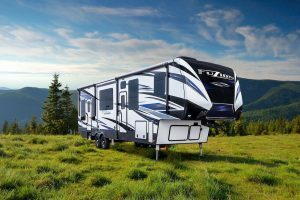 And about 30 percent of it is federally protected wilderness, where motorized and mechanized uses are prohibited, according to Mitchell. The conservancy holds a number of workshops and field trips over the course of the year, highlighted by its popular summer float trip on the Roaring Fork River. Sunday’s program was designed to drive home the point that the snowpack “is a natural storage system for water,” she said. Gina Mile, a teacher at the Marble Charter School, was among the people who attended the workshop. She said she liked how the snow survey integrated science and math. That could be inspiring for young minds, she said. Mile said Mitchell is scheduled to visit the charter school soon, so she is eager to see the snow survey lessons applied in a way young students can understand. From now through spring, everyone from river guides to farmers will watch the snowpack to help gauge runoff. So far, snowpack levels are impressive, thanks to the non-stop snow over the first three weeks of January. 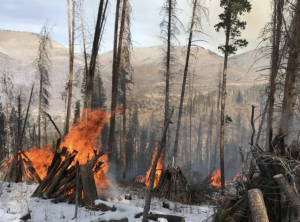 The pace of snowpack accumulation slowed significantly in February, but it still remains well above median at the headwaters of the Roaring Fork River east of Aspen as well as at three sites each in the Crystal and Fryingpan drainages. The Natural Resources Conservation Service relies primarily on automated Snow Telemetry sites now for data, including one on McClure Pass. Wyle gave a brief tour of the facilities there Sunday. The site transmits data each hour on snow depth, cumulative precipitation and snow water equivalent. However, Wyle and his counterparts around the state still ski or snowshoe to select sites each month for a manual check of the automated data. He and his colleagues in the Glenwood Springs office do field tests at Nast Lake up the Fryingpan Valley. 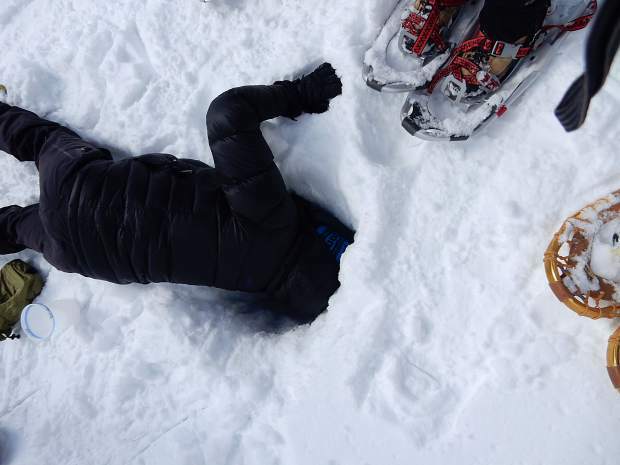 Sunday’s field operation provided a glimpse of how the snow survey workers gather their data.